All United Nations records, whether paper or electronic, must be disposed in accordance with approved retention schedules. While records should not be destroyed when there is still a need for them, it is also important not to keep records longer than is necessary, to minimise storage costs and enhance retrieval efficiency. If a decision is made to retain records longer than the minimum retention period a record of the reasons for the decision should be documented to assist disposal at a later date. Provide basic documentation of the records to be destroyed. A high level description of the records series to be destroyed with the date range (e.g. travel arrangements files, 2012-2014) is sufficient to document the destruction of the records for transparency and accountability. Records destruction logs must be filed along with other records management files, such as the list of records that have been transferred to ARMS for storage, etc. Get authorization for disposal from managers. No authorisation from ARMS is required. Request secure records disposal bins through a work order in iNeed. Depending on the Department and the nature of the records, sensitive records may also be shredded ‘in-situ’. Records should always be disposed of with the same level of security that was applied during their lifetime. Please note that extra care should be given to records containing sensitive personal information. Please refer to ST/SGB/2007/6 for further information. United Nations offices are encouraged to conduct an annual clean-up of their records, preferably in January of each year, as calendar year is the most frequent retention trigger. For records that have been transferred to ARMS repositories, two levels of authorization are required for the destruction of the records. ARMS will follow the approved retention schedule and send a list of records due for disposal to a Senior Official from the office which owns the records, for approval. Once the approval is received from the originating office, the Chief of ARMS will give final authorization for the destruction. ARMS does not dispose of records without the consent of the relevant office. Electronic records may only be deleted or destroyed in accordance with approved retention schedules. If your office does not have a retention schedule, please contact us for guidance. In record-keeping systems such as Unitedocs, all records are assigned to retention schedules at the point of creation. When the records are eligible for destruction, system administrators effect the destruction of the records; this task is not performed by individual users. 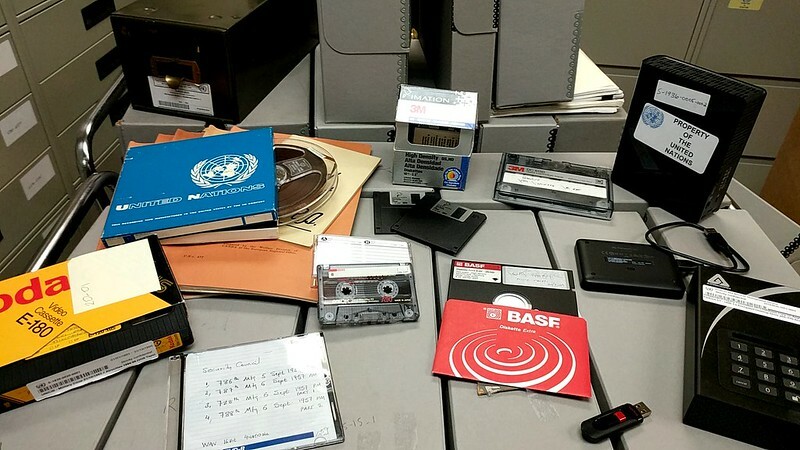 On United Nations shared drives, offices are responsible for deleting their working files and other non-records material on a regular basis. ARMS Guidelines on managing records on shared drive recommends that office do not retain non-record material beyond two years. If the office uses the share drive in lieu of a record-keeping system, the disposal of the records must be in keeping with approved retention schedules. The Office of Information and Communication Technology (OICT) is responsible for the sanitization of shared drives when required by the office. To permanently delete electronic records stored on external media such as key drives or external hard drives, etc. it is not sufficient to delete the records because data can easily be recovered. It is particularly important to use the appropriate sanitization techniques to ensure that sensitive content is appropriately removed from the device. Please refer to OICT equipment disposal guide.